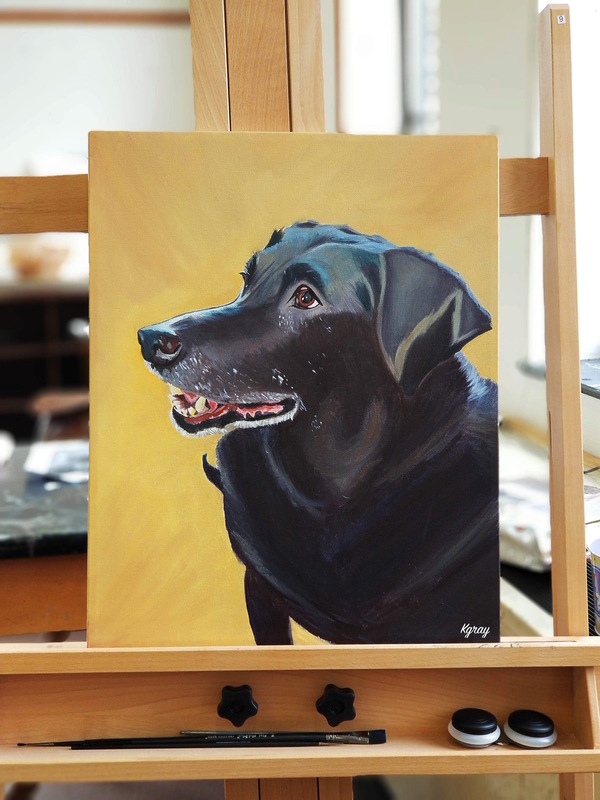 I am an artist that primarily focuses on pet portraiture. In my art, I like to capture the lifelike and realistic representation of loved pets in natural settings. My subject is animals, most specifically loved pets. I use oil and watercolor paints on paper and gessobord. I like to focus on details and texture of fur, as well as the wetness of noses and eyes of the animals. My concept is to convey the love that animals have for us through their portraits and to also honor them for that unconditional love they give us humans. To have something detailed and permanent to remember them by, even long after they are gone, is very important to me. I take inspiration from many contemporary pet portrait artists, two of which are Julee Willow and James Ruby, as well as looking at historical paintings that include pet portraits. Growing up in my family, there was always a pet in our house. From the time before I was born, even to the present and future, we have always had a dog or two in our house. I have been able to experience the deep connection and love for my pets since I was really young, as well as the heart ache with losing them. The pain that I have experienced with the losses of my beloved pets and best friends has really showed me how much I care for animals around me and motivates me to express this through my portraiture as a way for me to to cope as well as a way to honor their memory and the love we have shared with them. My second focus is illustration using watercolor paints and pen on watercolor paper. My subject is architectural scenes and tattoo designs. My architectural illustrations give myself a sense of grounding of places that I have been that are significant and important to my life and my journey. For these pieces, I use illustration along with a photographic method called photograming to show the images in a different light. The photograms allow me to see where the pigment bled into the white areas, therefore showing the errors underneath the painting. This to me illustrates the tough times that I have gone through in my journey through these places and that memories are made of more than brick or stone. These pieces are reminders for me to see where I have been and to know the hardships, as well as good times, I have had and the lessons I have learned along the way. My tattoo designs give specific meanings to myself and patrons. They are primarily pieces that are influenced by specific music artists and lyrics and offer inspirational motive and encouragement. I am a current undergraduate student at Notre Dame of Maryland University in Baltimore (Class of 2018). I like to paint using oils and watercolors as well as drawing illustrations in pen and ink. I also like to work with both film and digital photography. Pets and animals are my main focuses in my work. They have been an important factor in my life and I wish to convey their importance through illustrations and paintings. I also like to work with smaller architectural studies to better understand the places of significance in my life. I like to design illustrations for future tattoo designs based on lyrical pieces from music or movie quotes.